Thursday was Norma’s big day on the town! Well, more like couple of hours on the town… nevertheless, Mike and I left Tom’s about 10:00. I was headed to Manhattan; he was headed to Queens and parts beyond. 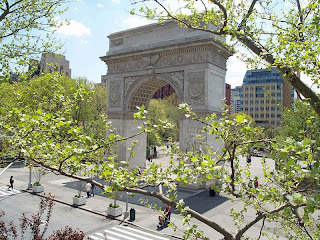 I was going to “Broadway in Bryant Park”; he was going to a job interview. Anywho, we found ourselves riding the D train ride with NERVOUS GUY. This guy was pretty young, dark-skinned, bald with a goatee. He was also wearing very dirty clothes—very dirty clothes! But he was obviously quite interested in his appearance. Sometimes you get a subway car that has shiny walls at each end. We were in one of those and the guy couldn’t stop looking at the wall, rubbing his head, straightening his collar, pulling up his pants, etc. He also made some strange hand gestures and talked to himself a bit. I couldn’t understand what he was saying, but I got the distinct impression that he was going to a job interview and was afraid he wouldn’t get the job. I kind of think he probably didn’t get it, but who knows? After a few stops he went to the other end of the car and did the same thing down there. Good luck to him. I had decided that the shoes I brought on the trip were too small and trust me, you cannot walk around New York in shoes that are too small. (Unless you have a high tolerance for pain and don’t care whether you lose your toenails.) After Mike switched trains, I was contemplating said shoes and I decided I needed new ones. There are lots of Payless stores, but I couldn’t think where one was, so I decided to hit up the K-Mart in Astor Place. It was a bust. If you typically shop at a K-Mart, let me encourage you to take a trip to your nearest Target or Wal-Mart before you buy their crappy shoes. You’ll get a better selection and much better quality!!! 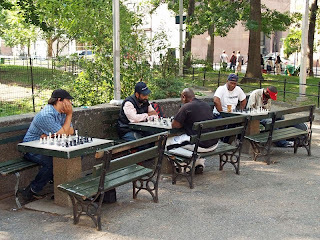 I went ahead and had breakfast at one of the 5,000 Starbucks franchises in Astor Place, then I got a wild hair and decided to walk over to Washington Square Park to watch some chess. There were guys with their boards set up, but no one was playing, so pfft. I got back on the train to head to Bryant Park and found myself in a car with about 30 kids from the Flatbush YMCA. I’m guessing they ranged in age from 5-10 and they were attended by two very harried 20-somethings. The guy was trying to keep the boys seated; the woman was trying to keep a little girl from eating her lunch. God bless them. I did feel sorry for them, but I was also amused. I have no idea where they were going, but one little girl was talking about Times Square. You couldn’t pay me enough to take five kids to Times Square, much less 30. It was kind of hot and I got there a little bit early, so I walked around a bit and then found a place over on the side in the shade. There were performers from five shows that day: Spring Awakening, Gypsy, Xanadu, Mary Poppins and Wicked. I’m wasn’t familiar with Spring Awakening, and I’m still not, but I was really excited because I’m familiar with the songs from the rest. All of the performers were awesome, except I was really disappointed in the selections from Gypsy. They only did two songs, while everyone else did three. They did “If Momma Was Married” and a song with the farmboys (yawn) and that was it. Where’s MAMA ROSE? If Patti Lupone didn’t want to show up, they could have at least sent her understudy. You can’t have selections from Gypsy and not have “Everything’s Coming Up Roses” or “Rose’s Turn!” At least give us the freakin’ strippers!!! After that was over, I darted into the library to go to the bathroom and headed off to kill a little time and look for a Payless. The library is kind of a pain, because they check your bags when you go in and when you come out and it’s not like any library you’re thinking of, I promise you. If you want a book, you’ll not find one easily at this branch. Still, when you gotta go, you gotta go…and it’s a cool building. I walked a big circle and found a Payless on right by Grand Central Station. (I also found Michael Jordan’s Steakhouse. I didn’t even know he had one.) I traded in my too small shoes for just right ones and I was good to go. As I left the store, there came half a dozen or so NYPD cars, running lights and sirens. Wonder where they were going?